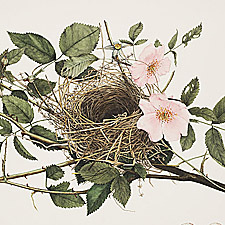 The Illustrations of the Nests and Eggs of Birds of Ohio is an online project first developed in May 2004. Joy M. Kiser is the librarian for the National Endowment for the Arts and a "Behind the Scenes Volunteer" in the Joseph F. Cullman 3rd Library of Natural History. Mr. Nelson Jonnes, Stillwater, Minnesota. Lloyd Jonnes, Ph.D., Washington, D.C. The Ohio Historical Society, 1982 Velma Ave., Columbus, Ohio 43211-2497. The Cleveland Museum of Natural History, 1 Wade Oval Drive, University Circle, Cleveland, Ohio 44106-1767. The Pickaway County Historical and Genealogical Society, Clark Moore House, 304 South Court Street, Circleville, Ohio 43113. Epson Perfection 1640SU flatbed scanner. Images stored as TIFFs. High resolution web images reduced to 96 dpi and rescaled to 750 pixels on the short side. Low resolution images reduced to 256 colors and rescaled to 750 pixels on the short side.